“Pfft – I’m all for it if it helps us get to a decision.” said Max. He’d clearly had enough too. “Give me a minute to get set up,” said Jack. He hooked his computer to the data projector. Within a couple of minutes, he had a blank IBIS map displayed on-screen. This done, he glanced up at the others: they were looking at screen with expressions ranging from curiosity (Mary) to skepticism (Max). “Just a few words about what I’m going to do, he said. “I’ll be using a notation called IBIS – or issue based information system – to capture our discussion. IBIS has three elements: issues, ideas and arguments. I’ll explain these as we go along. OK – Let’s get started with figuring out what we want out of the discussion. What’s our aim?” he asked. His starting spiel done, Jack glanced at his colleagues: Max seemed a tad more skeptical than before; Rick ever more bored; Andrew and Mary stared at the screen. No one said anything. “So, what’s next,” asked Max. He still looked skeptical, but Jack could see that he was intrigued. Not bad, he thought to himself…. “Good,” said Jack, “You’ve given us another option and some ways in which we might go about implementing the option. Ideally, each node should represent a single – or atomic – point. So I’ll capture what you’ve said like so.” He typed as fast he could, drawing nodes and filling in detail. “Umm..not sure how it would work, but what about co-development?” Suggested Rick. “Do you mean collaborative development with external resources?” asked Jack as he began typing. “What about costs? We have a limited budget for this,” said Mary. “Well, we must have all the priority 1 features described in the scoping document implemented by the end of the year,” said Andrew. One can always count on the manager to emphasise constraints. “I’ve said it before; I’ll say it again: I think doing it ourselves is a dum..,.sorry, not a good idea. It is fraught with too much risk…” started Max. “Time – it can take much longer,” said Max. “We’ve already captured that as a con of the do-it-ourselves approach,” said Jack. 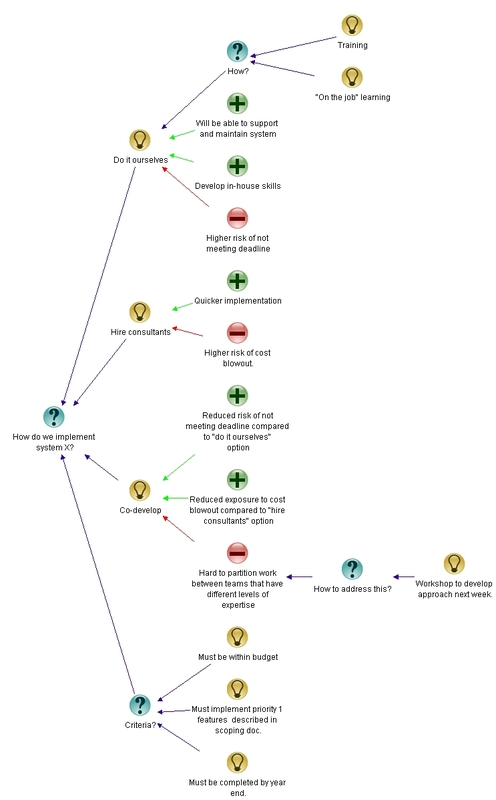 “That’s a very good point,” said Jack, as he changed the node to read: higher risk of not meeting deadline. The map was coming along nicely now, and had the full attention of folks in the room. “Doing it through consultants will enable us to complete the project quicker,” countered Max. Jack added in the pros and paused, giving the group some time to reflect on the map. Rick and Mary, who were sitting next to each other, had a whispered side-conversation going; Andrew and Max were writing something down. Jack waited. “I can’t see how co-development will reduce the time risk – it will take longer than doing it through consultants.” said Max. “So you’re saying that it reduces implementation time and results in a smaller exposure to cost blowout?” asked Jack. Jack added in the pros and waited. “I still don’t see how it reduces time,” said Max. “It does, when compared to the option of doing it ourselves,” retorted Mary. He looked at Mary and Max. – both seemed to OK with this, so he typed in the changes. “From what’s on the map, it seems that co-development is the best option,” said Andrew. He looked around to see what the others thought: Rick and Mary were nodding; Max still looked doubtful. Jack typed this in as a con. Jack typed in this exchange, as the others started to gather their things. “Anything else to add?” he asked. Everyone looked up at the map. “No, that’s it, I think,” said Mary. Jack looked around the group. Helped along by IBIS and his facilitation, they’d overcome their differences and reached a collective decision. He had thought it wouldn’t work, but it had. “ Jack, thanks for your help with the discussion. IBIS seems to be a great way to capture discussions. Don’t forget to send us those references,” said Mary, gathering her notes. “See you later,” replied Jack. 1. Jeff Conklin’s book is a must-read for any one interested in dialogue mapping. I’ve reviewed it here. 2. For more on Compendium, see the Compendium Institute site. 3. 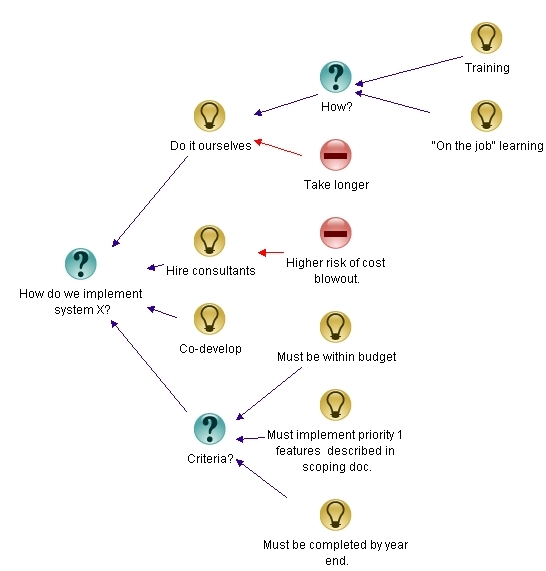 See Paul Culmsee’s series of articles, The One Best Practice to Rule Them All, for an excellent and very entertaining introduction to issue mapping. 4. See this post and this one for examples of how IBIS can be used to visualise written arguments. 5. See this article for a dialogue mapping story by Jeff Conklin. All project managers have to deal with uncertainty as a part of their daily work. Project schedules, so carefully constructed, are riddled with assumptions and uncertainties – particularly in task durations. Most project management treatises (the PMBOK included) recognise this, and so exhort project managers to include uncertainties in their activity duration estimates. However, the same books have little to say on how these uncertainties should be integrated into the project schedule in a meaningful way. Sure, well-established techniques such as PERT incorporate probabilities into a schedule via an averaged or expected duration, but the final schedule is deterministic – i.e each task is assigned a definite completion date, based on the expected duration. Any float that appears in the schedule is purely a consequence of an activity not being on the critical path. The float, such as it is, is not an allowance for uncertainty. 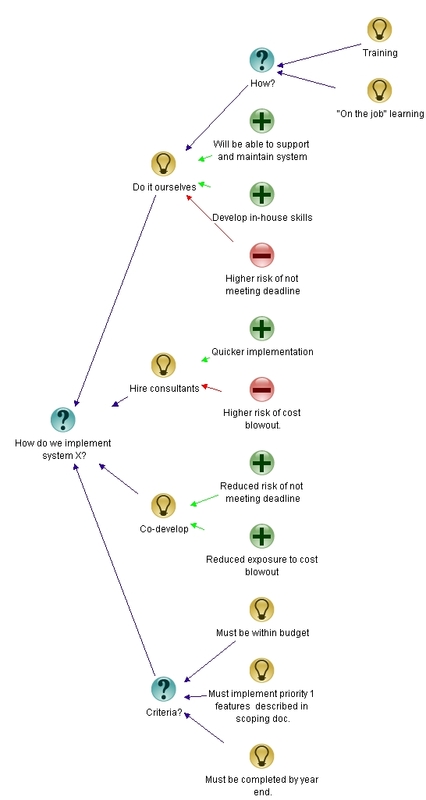 Since PERT was invented in the 1950s, there have been several other attempts to incorporate uncertainty into project scheduling. Some of these include, Monte Carlo simulation and, more recently, Bayesian Networks. 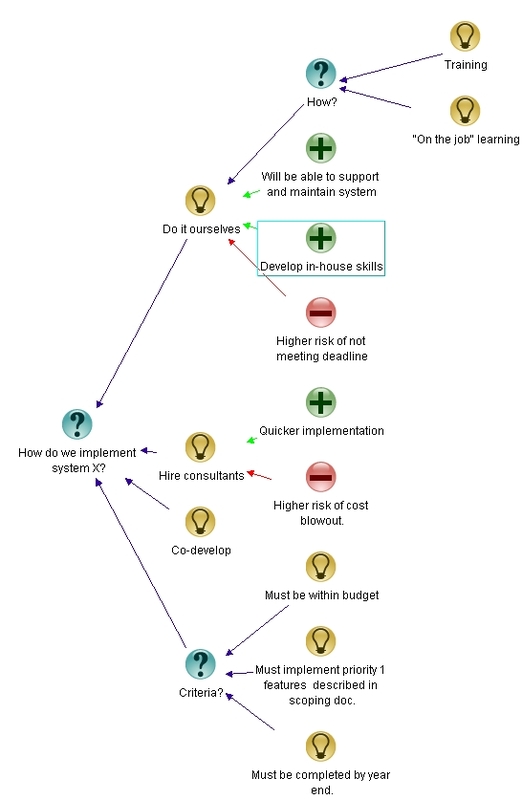 Although these techniques have a more sound basis, they don’t really address the question of how uncertainty is to be managed in a project schedule, where individual tasks are strung together one after another. What’s needed is a simple technique to protect a project schedule from Murphy, Parkinson or any other variations that invariably occur during the execution of individual tasks. In the 1990s, Eliyahu Goldratt proposed just such a technique in his business novel, Critical Chain. This post presents a short, yet comprehensive introduction to Goldratt’s critical chain method . I begin with a discussion of some general characteristics of activity or task estimates, highlighting the reason why task estimators tend to pad up their estimates. This is followed by a discussion on why the buffers (or safety) that estimators build into individual activities don’t help – i.e. why projects come in late despite the fact that most people add considerable safety factors on to their activity estimates. This then naturally leads on to the heart of the matter: how buffers should be added in order to protect schedules effectively. Consider an activity that you do regularly – such as getting ready in the morning. You have a pretty good idea how long the activity takes on average. Say, it takes you an hour on average to get ready – from when you get out of bed to when you walk out of your front door. Clearly, on a particular day you could be super-quick and finish in 45 minutes, or even 40 minutes. However, there’s a lower limit to the early finish – you can’t get ready in 0 minutes!. On the other hand, there’s really no upper limit. On a bad day you could take a few hours. Or if you slip in the shower and hurt your back, you mayn’t make it at all. If we were to plot the probability of activity completion for this example as a function of time, it might look something like I’ve depicted in Figure 1. 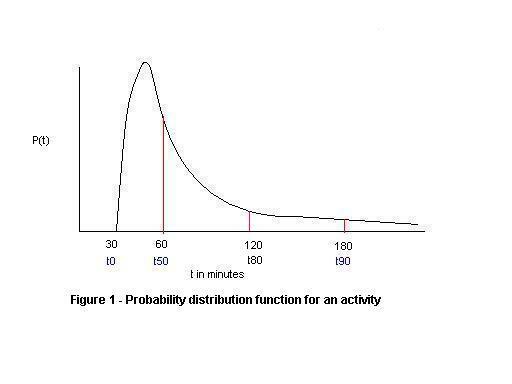 The distribution starts at a non-zero cutoff (corresponding to the minimum time for the activity); increases to a maximum (corresponding to the most probable time); and then falls off rapidly at first, then with a long, slowly decaying, tail. The mean (or average) of the distribution is located to the right of the maximum because of the long tail. In the example, (30 mins) is the minimum time for completion so the probability of finishing within 30 mins is 0%. There’s a 50% probability of completion within an hour, 80% probability of completion within 2 hours and a 90% probability of completion in 3 hours. The large values for and compared to are a consequence of the long tail. OK, this particular example may be an exaggeration – but you get my point: if you want to be really really sure of completing any activity, you have to add a lot of safety because there’s a chance that you may “slip in the shower” so to speak. It turns out that many phenomena can be modeled by this kind of long-tailed distribution. Some of the better known long-tailed distributions include lognormal and power law distributions. A quick (but admittedly informal) review of the project management literature revealed that lognormal distributions are more commonly used than power laws to model activity duration uncertainties. This may be because lognormal distributions have a finite mean and variance whereas power law distributions can have infinite values for both (see this presentation by Michael Mitzenmacher, for example). [An Aside:If you’re curious as to why infinities are possible in the latter, it is because power laws decay more slowly than lognormal distributions – i.e they have “fatter” tails, and hence enclose larger (even infinite) areas.]. In any case, regardless of the exact form of the distribution for activity estimates, what’s important and non-controversial is the short cutoff, the peak and long, decaying tail. Most activity estimators are intuitively aware of the consequences of the long tail. They therefore add a fair amount of “air” or safety in their estimates. Goldratt suggests that typical activity estimates tend to correspond to or . Despite this, real life projects still have difficulty in maintaining schedules. Why this is so is partially answered in the next section. Sequential steps: If an activity finishes early, the successor activity rarely starts right away. More often, the successor activity starts only when it was originally scheduled to. Usually this happens because the resource responsible for the successor activity is not free – or hasn’t been told about the early finish of the predecessor activity. On the other hand, if an activity finishes late, the start of the successor activity is delayed by at least the same amount as the delay. The upshot of all this is that – delays accumulate but early finishes are rarely taken advantage of. So, in a long chain of sequential activities, you can be pretty sure that there will be delays. Parallel steps: In this case, the longest duration activity dictates the finish time. For example, if we have three parallel activities that take 5 days each. If one of them ends up taking 10 days, the net effect is that three activities, taken together, will complete only after 10 days. In contrast, an early finish will not have an effect unless all activities finish early (and by the same amount!). Again we see that delays accumulate; early finishes don’t. The above discussion assumed that activities are independent. 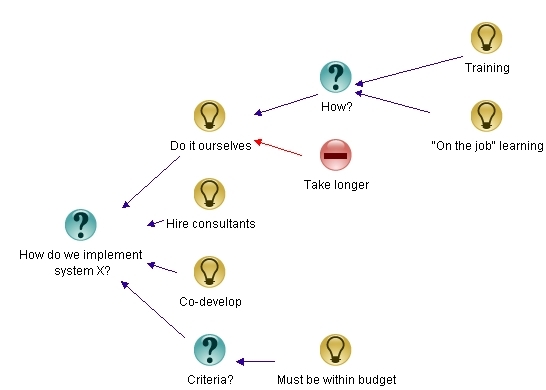 In a real project activities can be highly dependent. In general this tends to make things worse – a delay in an activity is usually magnified by a dependent successor activity. This partially explains why projects come in late. However it’s not the whole story. According to Goldratt, there are a few other factors that lead to dissipation of safety. I discuss these next. Multitasking It is recognised that multitasking – i.e. working on more than one task concurrently – introduces major delays in completing tasks. See these articles by Johanna Rothman and Joel Spolsky, for a discussion of why this is so. I’ve discussed techniques to manage multitasking in an earlier post. Student syndrome This should be familiar to any one who’s been a student. When saddled with an assignment, the common tendency is to procrastinate until the last moment. This happens on projects as well. “Ah, there’s so much time. I’ll start later…” Until, of course, there isn’t very much time at all. Parkinson’s Law states that “work expands to fill the allocated time.” This is most often a consequence of there being no incentive to finish a task early. In fact, there’s a strong disincentive from finishing early because the early finisher may be a) accused of overestimating the task or b) rewarded by being allocated more work. Consequently people tend to adjust their pace of work to just make the scheduled delivery date, thereby making the schedule a self-fulfilling prophecy. 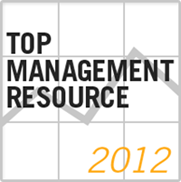 Any effective project management system must address and resolve the above issues. 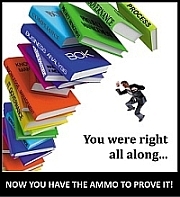 The critical chain method does just that. Now with the groundwork in place, we can move on to a discussion of the technique. We’ll do this in two steps. First, we discuss the special case in which there is no resource contention – i.e. multitasking does not occur. The second, more general, case discusses the situation in which there is resource contention. In this section we look at the case where there’s no resource contention in the project schedule. In this (ideal) situation, where every resource is available when required, each task performer is ready to start work on a specific task just as soon as all its predecessor tasks are complete. Sure, we’ll also need to put in place a process to notify successor task performers about when they need to be ready to start work, but I’ll discuss this notification process a little later in this section. Let’s tackle Parkinson and the procrastinators first. To cure habitual procrastinators and followers of Parkinson, Goldratt suggests that project task durations estimates be based on a 50% probability of completion. This corresponds to an estimate that is equal to for an activity (you may want to have another look at Figure 1 to remind yourself of what this means). Remember, as discussed earlier, estimates tend to be based on or , both of which are significantly larger than because of the nature of the distribution. The reduction in time should encourage task performers to start the task on schedule, thereby avoiding the student syndrome. Further, it should also discourage people from deliberately slowing their work pace, thereby preventing Parkinson from taking hold. Removal of individual activity completion dates from the schedule altogether. The only important date is the project completion date. No penalties for going over the estimate. Management must accept that the estimate is based on , so the activity is expected to overrun the estimate 50% of the time. The above points should be explained clearly to project team members before attempting to elicit estimates from them. Assume that the initial estimates obtained from team members are or , so simply halve these to get a rough . This is the approach Goldratt recommends. However, I’m not a fan of this method because it is sure to antagonise folks. Another option is to ask the estimator how long a task is going to take. They’ll come back to you with a number. This is likely to be their or . Then ask them for their , explaining what it means (i.e. estimate which you have a 50% chance of going over). They should come back to you with a smaller number. It may not be half the original estimate or less, but it should be significantly smaller. Yet another option is to calibrate estimators’ abilities to predict task durations based on their history (i.e. based on how good earlier estimates were). In the absence of prior data one can quantify an estimator’s reliability in making judgements by asking him or her to answer a series of trivia questions, giving an estimated probability of being correct along with each answer. An individual is said to be calibrated if the fraction of questions correctly answered coincides (or is close to) their stated probability estimates. In theory, a calibrated individual’s duration estimate should be pretty good. However, it is questionable as to whether calibration as determined through trivia questions carries over to real-world estimates. See this site for more on evaluating calibration. Folks who’ve read my articles on cognitive biases in project management (see this post and this one) may be wondering how these fit in to the above argument. According to Goldratt, most people tend to offer their or numbers, rather than their ones. The reason this happens is that folks tend to remember the instances when things went wrong, so they pad up their estimates to avoid getting burned again – a case of the availability bias in action. Getting team members to come up with reliable numbers depends very much on how safe they feel doing so. It is important that management understands that there is a 50% chance of not meeting deadlines for an individual tasks; the only important deadline is the completion of the project. This is why Goldratt and other advocates of the critical chain method emphasise that a change in organisational culture is required in order for the technique to work in practice. Details of how one might implement this change is out of scope for an introductory article, but readers should be aware that the biggest challenges are not technical ones. 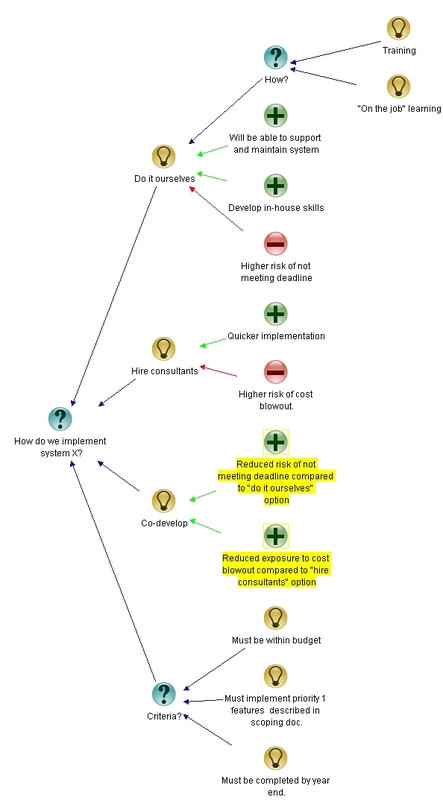 Readers may have noticed a problem arising from the foregoing discussion of estimates: if there is no completion date for a task, how does a successor task performer know when he or she needs to be ready to start work? This problem is handled via a notification process that works as follows: the predecessor task peformer notifies successor task performers about expected completion dates on a regular basis. These notifications occur at regular, predetermined intervals. Further, a final confirmation should be given a day or two before task completion so all successor task performers are ready to start work exactly when needed. Goldratt calls this notification process the resource buffer. It is a simple yet effective method to ensure that a task starts exactly when it should. Early finishes are no longer wasted! Alright, so now we’ve reduced activity estimates, removed completion dates for individual tasks and ensured that resources are positioned to pick up tasks when they have to. What remains? Well, the most important bit really – the safety! Since tasks now only have a 50% chance of completion within the estimated time, we need to put safety in somewhere. The question is, where should it go? 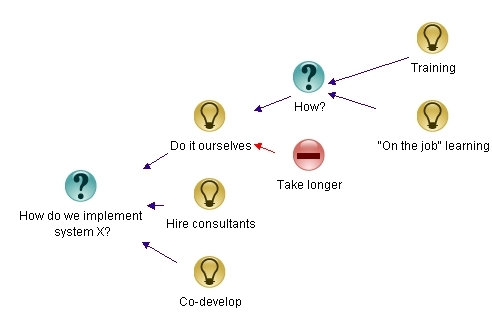 The answer lies in recognising that the bottleneck (or constraint) in a project is the critical path. Any delay in the critical path necessarily implies a delay in the project. Clearly, we need to add the safety somewhere on the critical path. I hope the earlier discussion has convinced you that adding safety to individual tasks is an exercise in futility. Goldratt’s insight was the following: safety should be added to the end of the critical path as a non-activity buffer. He calls this the project buffer. If any particular activity is delayed, the project manager “borrows” time from the project buffer and adds it on to the offending activity. On the other hand, if an activity finishes early the gain is added to the project buffer. 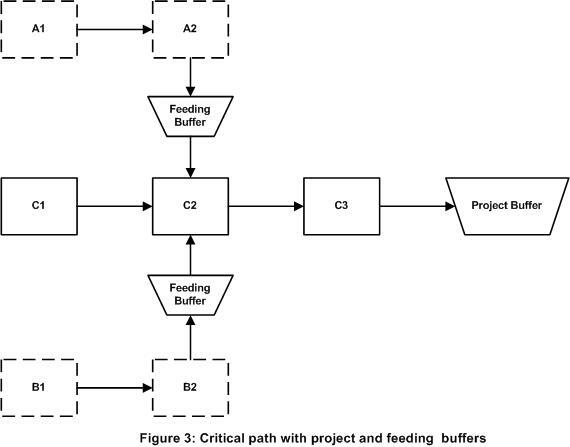 Figure 2 depicts a project network diagram with the project buffer added on to the critical path (C1-C2-C3 in the figure). What size should the buffer be? As a rule of thumb, Goldratt proposed that the buffer should be 50% of the safety that was removed from the tasks. Essentially this makes the critical path 75% as long as it would have been with the original ( or ) estimates. Other methods of buffer estimation are discussed in this book on critical chain project management. 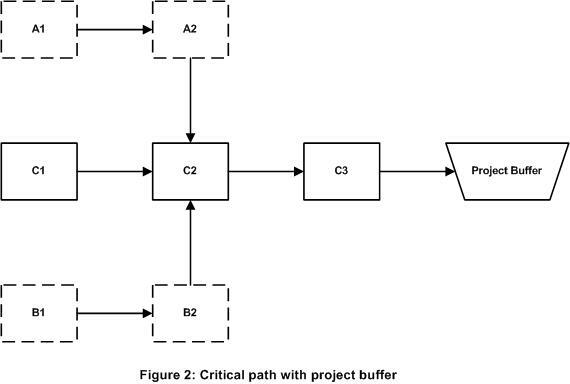 As shown in Figure 2 the project buffer protects the critical path. However, delays can occur in non-critical paths as well (A1-A2 and B1-B2 in the figure). If long enough, these delays can affect subsequent critical path. To prevent this from happening, Goldratt suggests adding buffers at points where non-critical paths join the critical path. He terms these feeding buffers. Figure 3 depicts the same project network diagram as before with feeding buffers added in. Feeding buffers are sized the same way as project buffers are – i.e. based on a fraction of the safety removed from the activities on the relevant (non-critical) path. This completes the discussion of the case where there’s no resource contention. In this special case, the critical chain of the project is identical to the critical path. The activity durations for all tasks are based on t50 estimates, with the project buffer protecting the project from delays. 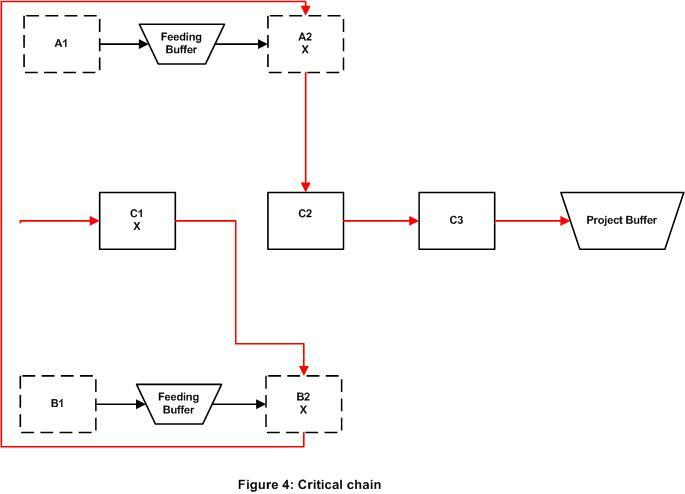 In addition, the feeding buffers protect critical chain activities from delays in non-critical chain activities. Now for the more general case where there is contention for resources. 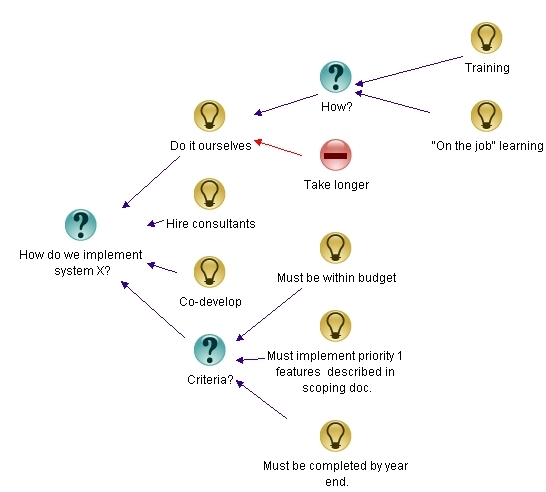 Resource contention implies that task performers are scheduled to work on multiple tasks simultaneously, at one or more points along the project timeline. Although it is well recognised that multitasking is to be avoided, most algorithms for finding the critical path do not take resource contention into account. The first step, therefore, is to resource level the schedule – i.e ensure that tasks that are to be performed the same resource(s) are scheduled sequentially rather than simultaneously. Typically this changes the critical path from what it would otherwise be. This resource leveled critical path is the critical chain. The above can be illustrated by modifying the example network shown in Figure 3. Assume tasks C1, B2 and A2 (marked X) are performed by the same resources. The resource leveled critical path thus changes from that shown in Figures 2 and 3 to that shown in Figure 4 (in red). As per the definition above, this is the critical chain. Notice that the feeding buffers change location, as (by definition) these have to be moved to points where non-critical paths merge with the critical path. The location of the project buffer remains unchanged. This completes my introduction to the critical chain method. Before closing, I should mention that there has been some academic controversy regarding the critical chain method. 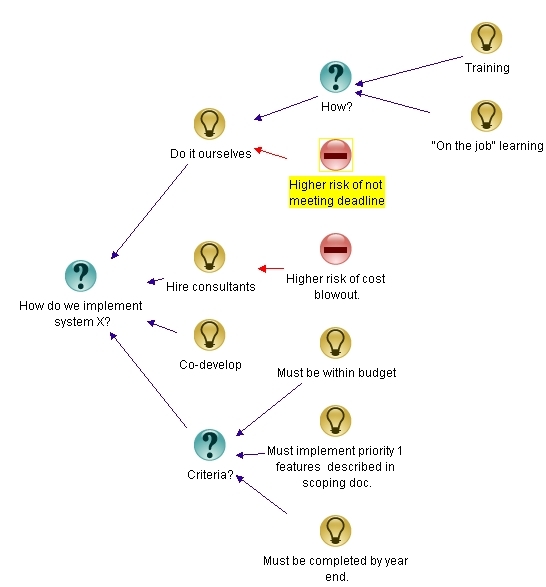 In practice, though, the method seems to work well as evidenced by the number of companies offering consulting and software related to critical chain project scheduling. Critical Chain Scheduling and Buffer Management . . . Getting Out From Between Parkinson’s Rock and Murphy’s Hard Place by Francis Patrick. Critical Chain: a hands-on project application by Ernst Meijer. The best place to start, however, is where it all began: Goldratt’s novel, Critical Chain. A comment by John Rusk on this post got me thinking about the effects of cognitive biases on the perception and analysis of project risks. A cognitive bias is a human tendency to base a judgement or decision on a flawed perception or understanding of data or events. A recent paper suggests that cognitive biases may have played a role in some high profile project failures. The author of the paper, Barry Shore, contends that the failures were caused by poor decisions which could be traced back to specific biases. A direct implication is that cognitive biases can have a significant negative effect on how project risks are perceived and acted upon. If true, this has consequences for the practice of risk management in projects (and other areas, for that matter). This essay discusses the role of cognitive biases in risk analysis, with a focus on project environments. Following the pioneering work of Daniel Kahneman and Amos Tversky, there has been a lot of applied research on the role of cognitive biases in various areas of social sciences (see Kahneman’s Nobel Prize lecture for a very readable account of his work on cognitive biases). A lot of this research highlights the fallibility of intuitive decision making. But even judgements ostensibly based on data are subject to cognitive biases. An example of this is when data is misinterpreted to suit the decision-maker’s preconceptions (the so-called confirmation bias). Project risk management is largely about making decisions regarding uncertain events that might impact a project. It involves, among other things, estimating the likelihood of these events occurring and the resulting impact on the project. These estimates and the decisions based on them can be erroneous for a host of reasons. Cognitive biases are an often overlooked, yet universal, cause of error. So, what role do cognitive biases play in project risk analysis? Many researchers have considered specific cognitive biases as project risks: for example, in this paper, Flyvbjerg describes how the risks posed by optimism bias can be addressed using reference class forecasting (see my post on improving project forecasts for more on this). However, as suggested in the introduction, one can go further. The first point to note is that biases are part and parcel of the mental make up of humans, so any aspect of risk management that involves human judgment is subject to bias. As such, then, cognitive biases may be thought of as meta-risks: risks that affect risk analyses. Second, because they are a part of the mental baggage of all humans, overcoming them involves an understanding of the thought processes that govern decision-making, rather than externally-directed analyses (as in the case of risks). The analyst has to understand how his or her perception of risks may be affected by these meta-risks. “Meta-risks are qualitative, implicit risks that pass beyond the scope of explicit risks. Most are born out the complex interaction between the behaviour pattern of individuals and those of organizational structures” (italics mine). Although he doesn’t use the phrase, Gray seems to be referring to cognitive biases – at least in part. This is confirmed by a reading of the paper. It describes, among other things, hubris (which roughly corresponds to the illusion of control) and discounting evidence that conflicts with one’s views (which corresponds to confirmation bias) as meta-risks. From this (admittedly small) sampling of the literature, it seems that the notion of cognitive biases as meta-risks has some precedent. Anchoring: This refers to the tendency of humans to rely on a single piece of information when making a decision. I have seen this manifest itself in task duration estimation – where “estimates plucked out of thin air” by management serve as an anchor for subsequent estimation by the project team. See this post for more on anchoring in project situations. Anchoring is a meta-risk because the over-reliance on a single piece of information about a risk can have an adverse effect on decisions relating to that risk. Availability: This refers to the tendency of people to base decisions on information that can be easily recalled, neglecting potentially more important information. As an example, a project manager might give undue weight to his or her most recent professional experiences when analysing project risks. Here availability is a meta-risk because it is a barrier to an objective consideration of risks that are not immediately apparent to the analyst. Representativeness: This refers to the tendency to make judgements based on seemingly representative, known samples . For example, a project team member might base a task estimate based on another (seemingly) similar task, ignoring important differences between the two. Another manifestation of representativeness is when probabilities of events are estimated based on those of comparable, known events. An example of this is the gambler’s fallacy. This is clearly a meta-risk, especially where “expert judgement” is used as a technique to assess risk (Why? Because such judgements are invariably based on comparable tasks that the expert has encountered before.). Selective perception: This refers to the tendency of individuals to give undue importance to data that supports their own views. Selective perception is a bias that we’re all subject to; we hear what we want to hear, see what we choose to see, and remain deaf and blind to the rest. This is a meta-risk because it results in a skewed (or incomplete) perception of risks. Loss Aversion: This refers to the tendency of people to give preference to avoiding losses (even small losses) over making gains. In risk analysis this might manifest itself as overcautiousness. Loss aversion is a meta-risk because it might, for instance, result in the assignment of an unreasonably large probability of occurrence to a risk. A particularly common manifestation of loss aversion in project environments is the sunk cost bias. In situations where significant investments have been made in projects, risk analysts might be biased towards downplaying risks. Information bias: This is the tendency of some analysts to seek as much data as they can lay their hands on prior to making a decision. The danger here is of being swamped by too much irrelevant information. Data by itself does not improve the quality of decisions (see this post by Tim van Gelder for more on the dangers of data-centrism). Over-reliance on data – especially when there is no way to determine the quality and relevance of data as is often the case – can hinder risk analyses. Information bias is a meta-risk for two reasons already alluded to above; first, the data may not capture important qualitative factors and second, the data may not be relevant to the actual risk. I could work my way through a few more of the biases listed here, but I think I’ve already made my point: projects encompass a spectrum of organisational and technical situations, so just about any cognitive bias is a potential meta-risk. Cognitive biases are meta-risks because they can affect decisions pertaining to risks – i.e. they are risks of risk analysis. Shore’s research suggests that the risks posed by these meta-risks are very real; they can cause project failure So, at a practical level, project managers need to understand how cognitive biases could affect their own risk-related judgements (or any other judgements for that matter). The previous section provides illustrations of how selected cognitive biases can affect risk analyses; there are, of course, many more. Listing examples is illustrative, and helps make the point that cognitive biases are meta-risks. However, it is more useful and interesting to understand how biases operate and what we can do to overcome them. As I have mentioned above, overcoming biases requires an understanding of the thought processes through which humans make decisions in the face of uncertainty. Of particular interest is the role of intuition and rational thought in forming judgements, and the common mechanisms that underlie judgement-related cognitive biases. A knowledge and awareness of these mechanisms might help project managers in consciously countering the operation of cognitive biases in their own decision making. I’m currently making some notes on these topics, with the intent of publishing them in a forthcoming essay – please stay tuned. Part II of this post published here. Sydney has a wealth of bushwalking trails within the metropolitan area. Over the last month or so, a friend and I have been exploring trails in and around Lane Cove National Park, a reserve within touching distance of the city centre. Last weekend, we revisited a walk we had done a few weeks ago – a small section of the Great North Walk, which runs all the way from Sydney to Newcastle. The section we covered extends between the northern Sydney suburbs of Chatswood and Thornleigh (~14 kms in all). The first time we did the walk, it took us a little over two hours; last weekend it took about three. The same trail, the same people and similar conditions (both days were sunny with a temperature of 18-20 C) – yet, the second time around, it took us nearly 50% longer than it did before. The answer is simple: although the weather conditions were similar during both walks, there had been about a week of rain prior to the second one. Consequently the trails were slushy and slippery, and we had to tone down our usual brisk pace. Along the way I slipped and fell, which slowed us down even further. So, although the two walks covered the same route in similar ambient conditions, one took much longer than the other owing to the difference in conditions on the ground and consequent events. Reword this just a bit and you have a nice analogy with packaged software implementation projects: two projects following the same plan in similar environments; one taking much longer than the other owing to different conditions on the ground and consequences thereof. Unfortunately, I reckon bushwalkers understand and appreciate the importance of ground conditions better than many project managers. 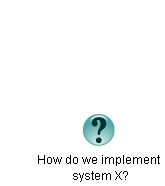 A company I consulted for was looking for an application to manage customer data (a CRM system by another name). After a complicated but thorough evaluation process they settled on a particular vendor, whose name is not important. One of the reasons for the choice was that the selected vendor had a lot of experience in the industry that my client was in. Having done several implementations the vendor knew the ins, outs and all the possible complications of implementing CRM systems in this industry. Since cost was a big concern, my client decided to go for a “near vanilla” implementation; one which involved minimal customisation of the base package offered by the vendor. This decision delighted the vendor, “That’s a good move,” said the account manager, “We’ll be able to offer you excellent terms as we know exactly what’s involved in this. We’ve done many vanilla implementations for similar sized companies in this industry.” My client was offered an attractive fixed price contract. Accompanying the contract was a high level scoping document which outlined the software and services that would be provided. I pointed out that the document didn’t provide enough detail on what the vendor would actually do. More importantly, it did not define which customisations were in scope and which weren’t. However, at a superficial level it appeared to address all my client’s concerns. Against my advice, the document was signed. The vendor’s project manager was very experienced. He’d done a similar project (for a similar sized company in the same industry) a year ago. “We’ve done so many of these,” he said, “It will be a walk in the park”. He inspired confidence, as good project managers do. He had drawn up a plans and schedules, accompanied by impressive Gantt charts and all sorts of project management paraphernalia. That’s not to say he didn’t consult us – he did ask for input on the tasks we were responsible for (data migration was one). This was provided to him. However, we had no idea about the duration of implementation-related tasks, so these were left entirely to him. These, he assured us, were drawn up on the basis of the scoping document which, in turn was based on that successful “walk in the park” from last year. Owing to “conditions on the ground” the project started falling behind almost immediately. To begin with, requirements gathering took double the allotted time because the initial scope (which was as plain as vanilla) excluded required functionality that wasn’t available out of the box. Most of this was easy enough to implement, and the vendor undertook to include it at no additional cost. However, as I’d expected, the analysis also revealed a handful of requirements that would be tricky to implement. The vendor – quite naturally – deemed these out of scope, and insisted that they would have to be charged separately. Much haggling followed and a compromise was struck, but it was one which left no one happy – the vendor got less than they wanted and my client paid more than they thought appropriate. It was the beginning of an extended and messy detour in the park. I won’t go into any of the details except to mention than the project took about 50% longer and cost about 50% more than originally projected. The vendor’s experience in traversing similar terrain in similar conditions had lead to undue optimism, as reflected in the statement that it would be a “walk in the park”. Every bushwalk is a unique one – even those on familiar trails may hold surprises. So it is with projects. As the PMBOK definition tells us, “a project is a temporary endeavour undertaken to create a unique product, service or result”. Packaged application vendors and their customers would do well to remember this.